Being physically fit can be very beneficial, allowing you to do more things. People often believe that attaining a six pack and building significant muscle mass is beyond their reach. This isn’t true because as long as you have the determination and sufficient self control to overcome temptation, it can be achieved. Despite what many people think, weight training can be done by almost anyone. It isn’t just an activity for people trying to lose weight or professional bodybuilders. If you’re skinny or just trying to maintain your weight, weight training is also for you. Strength training will bring you health benefits both now and in the long run. And don’t worry that you can never take a break or suffer losing all your gains. Once you’re on track, short breaks from strength training won’t mean immediate loss of muscle. 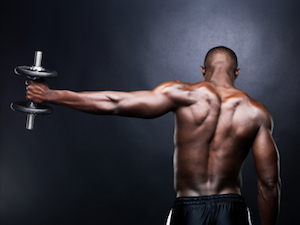 How Often Should You Strength Train? Many people believe that in order to gain lots of muscle, they need to strength train every muscle group everyday without fail. Besides exhausting yourself and keeping you confined to the gym, this type of regimen fails to allow the muscles any time to rest and rebuild. This will, in turn, slow the gains you wish to achieve. Depending on the time you have available and your goals, there are a couple ways to approach this. If you don’t have time to workout everyday and aren’t interested in being a true bodybuilder, you can exercise and do strength-training every other day. That will allow the muscles time to rest and rebuild between workouts. However, if you want to body build, you should work out about six days a week and rotate the muscle groups that you train on any given day. That will allow you to focus down on specific muscle groups and really attack them to maximize muscle growth, while allowing them a day or two of rest to recover and rebuild. Lose Fat Before Lifting: Before you start weight lifting, consider losing some of the fat that is covering your muscles. If you are trying to build some serious muscle and start working out hard and eating extra protein to bulk up, you will often add fat to your body along with the muscle. So, if you want that lean chiseled look you should lose some of your existing fat before you start trying to gain muscle to achieve stronger looking muscles. Warm Up and Stretch Before Lifting: Stretching is often taken for granted by people when it comes to exercising, as they don’t see its importance. Stretching before and after you exercise can prevent your body from sprains. However, doing the wrong types of stretching can also be dangerous. Before you workout, the best type of stretching is where you move your body, while the post-workout stretching is where you hold poses. Fuel Body With Food After: After a long day at the gym, you’ll need to fuel your body with plenty of nutrients. Without feeding your muscles, they won’t grow as fast as you want. It’s not enough to just pack away the protein though. You want to have carbohydrates as well to replenish your lost energy. What Are Some Post-Workout Foods? Once again this is the area that depends on your goals. If you’re trying to lose weight you don’t have to cram in a meal as soon after a workout as is reasonable. You just want to replenish some of your lost electrolytes and get a light snack with some carbs and protein for energy and muscle growth. Body builders take this post workout time very seriously. They usually want to eat something with quick carbs and protein right after working out, followed by a snack within the next 30-60 minutes. Whey Protein: This source of protein is both quick to prepare as a shake and a quickly digestible source of protein. This makes it ideal for right after a workout. Eggs: Packed with fairly cheap protein as well as other important nutrients, such as choline and leucine, eggs are often a popular choice. Don’t worry though, you don’t need to go with raw. In fact studies are indicating that a much higher percentage of the protein is bioavailable in cooked eggs than in raw eggs. Studies go back and forth on the health effects of egg yolks on cholesterol, so moderation and a diverse range of protein sources is probably a good idea. Oatmeal: Your body also needs carbohydrates in order for it to grow muscles, but the carbs in bread and chips aren’t really what your body needs. Oatmeal contains a high percentage of carbs that will really help your muscles when they are growing. Oatmeal can also help speed up your metabolism as well as eliminate constipation due to its high fiber content. Achieving the perfect body can be possible as long as you know what you need to do. Once you get your diet and exercise regimen right, your muscles will start to move toward that perfect appearance you crave. Many lifters feel the temptation to get bigger faster and easier by using some form of performance-enhancing drug. While it may be tempting, many of these compounds can be very detrimental to your overall health. Sticking with a clean diet and utilizing the right kinds of exercise strategies is the best way to avoid any type of side effects any type of drug or steroid would give you. Stay away from performance enhancing drugs. If you or someone you know is having trouble with this addiction, a drug treatment program may be their best bet for kicking the habit. There’s plenty you can be doing before, during and after your lift. Staying consistent is the piece of the puzzle that brings everything together. Many people find the gym good for company and like minded people and discuss the pros and cons of what they are trying to acheive. For those who prefer a home work-out articles such as this provide very useful tips.